It was becoming a habit; leaving late, slow, sated on the hotel buffet breakfast. This day, we were also late because we mended yet another puncture; my front tyre this time, for a touch of variety. Core muscles should ensure a good position on the bike, rather than leaning. Eventually, we left, seated a little further from our handlebars, crunching our stomach muscles and crossing our numb fingers in the hope that this would lessen the pain. 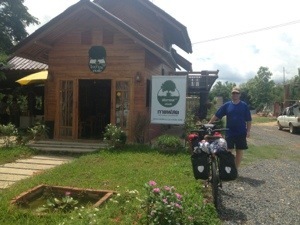 Thereafter, the ride to Uttaradit can be categorised by two things; the first of the hill stages and highways lined with durian fruit vendors. The durian is part of the Thailand right of passage due to being an indigenous fruit and for its disgusting odour. Inside the hard, spiked jacket, the fruit is akin to a sulphurous custard. Uttaradit is the principle producer in Thailand. And believe it or not, these fruits are pretty popular. Allegedly, once you get over the smell, you’ll love it. I did not. I already knew I did not like the stuff when we pulled up at the side of the road to get sugary drinks. When a pleasant woman, one of the stall holders, held out portions for Nick and I on a plate I tried to decline, that is until it began to seem rude to do so. When all I needed was water, I was left smacking my tongue against my cheeks, trying not to gag, trying to push the yellow goo down my throat. All the time smiling, because don’t get me wrong, I was grateful. The hill came shortly after, first of many on Route 11, as it turned out. It undulated to begin with, small climbs followed by rushing descents, lulling me into a sense that it was actually quite fun. Then someone forgot the drop. The carriageway split into two, leaving a crawler lane for trucks, and soon we were grinding upwards, HGVs chugging and wheezing past us. The road wrapped around the mountain and it was hard to see for more than a few hundred metres. Each corner bore hope that the summit was around it, but yielded only despair when it finally revealed another section of unrelenting climb. Nick was much stronger than me (and he told me later he attacked that hill as much for his Dad as anything, as it would have been his birthday that day) and I watched him push further up the mountain. I hated my body for how tired it was, how it could barely balance at those painful, slow speeds, how it let the front wheel to weave, using up vital energy, while my lungs felt like brittle shrink wrap. I was later to realise that this hill was actually short. But at the time I was elated when I got to the top – elated, red and drenched in sweat. And then it was all downhill to Den Chai, the outpost some 20km west of Phrae (pronounced ‘prayer’). 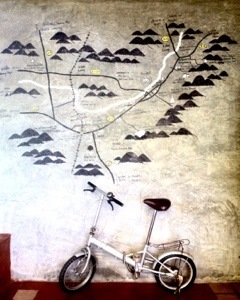 We stopped halfway at a small coffee shop, drawn by the regular signposts and the promise of caffeine. Its young female proprietor welcomed us with a huge smile. It turned out she’d been ‘on the ships’ (this means working on a cruise liner, as Nick did for a number of years) before she came back to Thailand with enough money to begin her business, so Nick chatted to her while I thought about how inspiring that was. 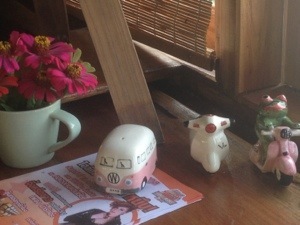 A cozy wooden cottage, flowered garden, a mural of the mountains painted by her brother and those ubiquitous emblems of travel (frogs on bikes and campervans) displayed on the counter, I felt a warmth from the coffee shop that didn’t come from my mug. The coffee was great and we left there with new hope (not least because the young owner had confirmed there were no more hills!). Stayed at Thai Phoom Garden, Phrae. Cycled 74.4km, check out what Strava says. No rain, no punctures, balanced by smelly fruit and upward cycling.